History tells us that in times of need this country turns to its women. A group of Blaine County women are taking a lesson from history by following in the footsteps of one such iconic American female, Rosie the Riveter. Rosie was a figurehead for all the American women who stepped in to the shoes of the male factory workers while they were fighting World War II. Modeled after this spunky gal, The Rosies are a "free-spirited" philanthropy group with a mission to help local charities by donating their time. The brainchild of Hailey resident Kat Vanden Heuvel, the group was born shortly after Vanden Heuvel's second child. "After my son, Tripp, was born, I decided to take some time to be a stay-at-home-mom," she said. Suddenly finding herself with lots of time on her hands she decided to act on a long-held ambition. "I'd always thought to myself, there are these great organizations in the valley such as the Little Black Dress Club and the Wood River Women's Charitable Foundation that do great works, but for me the dollars are a little short," she said, referring to the minimum donation such organizations require for membership. "I may not have the dollars, but now I do have the time. That's something I can give. So this seemed the perfect time to get something started." Vanden Heuvel's idea was to create a women's-only philanthropy group that would volunteer its time to organizations as a group. The group dynamic was important to Vanden Heuvel both because there's strength in numbers and because "it also had to be social and fun." "It's a way to give back to the community without just focusing on one organization or nonprofit, a way to be able to sample all the different charity organizations in the valley, to be able to give a little time to each one and in the process learn about each organization," Vanden Heuvel said. "Then, if you're interested in knowing more or getting more involved with a particular one, you've got a touch point." Another goal for The Rosies is to involve women from all walks of life. The concept of philanthropy has long been associated with giving money, a barrier for many. "While dollars are key for these organizations, your time can help them stretch the dollars other organizations are able to give," she said. Open to women of all ages and background, The Rosies place no barriers to membership—you just have to be willing to donate your time once or twice a month. Founded in February, so far The Rosies have applied their group muscle to a variety of tasks, including hanging art work for the Wood River Arts Alliance Children's Art Festival at the Community Campus, helping Sagebrush Equine Training Center for the Handicapped landscape its new headquarters at Swiftsure Ranch in Bellevue, reorganizing The Hunger Coalition's food warehouse, and handing out water and misting hot runners at the Sun Valley Half Marathon last weekend. Rosie member Kate Heinecke said she joined the group because she saw it as a good way to get out into the community. "I can learn more about different organizations, do some good while socializing and, frankly, as a much-needed excuse to get out of the house," said Heinecke, a mother of three. Currently, The Rosies have a roster of 20 members, but just 10 or 12 active participants. Next month they will be volunteering at the Sun Valley Center for the Arts wine auction and the San Francisco Ballet, a fundraiser for Sun Valley Adaptive Sports. Vanden Heuvel's vision is for The Rosies to be woven into the fabric of the local community, helping out wherever there is need. "Give us a task, big or small. It doesn't have to be pretty, we're here to get the job done!" she said. Rosie the Riveter would be proud. The Rosies is a philanthropy group based on donating time rather than money. The group is actively seeking new members. All women are welcome and there is no application process or monetary donation required. Join their Facebook group (search Rosies Wood River Valley), or email gkpeaks@gmail.com. They meet once a month to discuss proposed projects, and the next meeting is July 16 at 7:30 p.m. Organizations seeking The Rosies' assistance should contact Kat Vanden Heuvel at 720-4556. The Rosies are following in illustrious footsteps; two other women-only philanthropy groups in the Wood River Valley have donated thousands of dollars to local nonprofits over the years. The Little Black Dress Club-Wood River is a philanthropic giving circle with more than 65 members (find them at www.lbdcwr.org, they require a $300 annual donation), and the Wood River Women's Charitable Foundation aims to inspire and educate women to become leaders in philanthropy as well as effecting positive change in the community by pooling and distributing its members' resources. 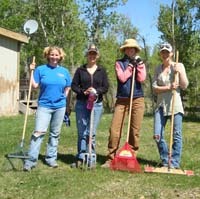 The foundation has more than 100 members; visit them at www.wrwcf.org. They require an annual donation of $1,075.